Asked to comment on German government and media reporting on the sorry state of the German military, retired Bundeswehr air force officer and military administrator Jochen Scholz said there were two basic reasons behind the current situation. A recent report by the German parliament's military commissioner has slammed the Bundeswehr's poor overall combat readiness, blaming years of budget cuts and poor management. The report says troops don't have enough protective vests, tents winter clothing and other basic equipment to participate in a major NATO mission. Furthermore, according to the military, many important weapons systems are not available for deployment and training. Speaking to Sputnik Deutschland about the situation, Lieut. Col (ret.) Jochen Scholz said that there were two overlying reasons for Berlin's growing concerns over the state of the Bundeswehr. 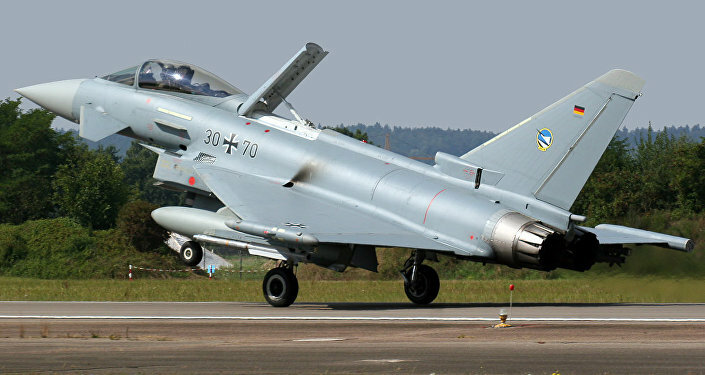 According to Scholz, who served in various NATO bodies and the Ministry of Defense after his retirement from the air force, after 1990 and German reunification, the Bundeswehr needed to completely rethink its priorities and mission. "Before that it was considered that we were a defensive army whose mission was to protect against a possible attack by the Warsaw Pact," he noted. "But then [after the Soviet collapse] the question arose of what to do with the Bundeswehr in a situation where the enemy ceased to exist. And someone came up with the 'wonderful' idea of participating in all sorts of missions abroad, at the Americans' insistence." German soldiers stand guard during the NATO Secretary-General Jens Stoltenberg's visit, 2014. In this situation, the officer said it wasn't really surprising that the issue of military reform has sprung up again and again, and that given Germany's participation in NATO missions abroad, things weren't always "going as smoothly as some might like." The Bundeswehr's deployments, stretching from Afghanistan to Africa to the Baltic countries, mean that the requirements are always changing, according to Scholz. "We have to deal with the weather, climactic and geographic conditions from North Africa to the Baltics to Afghanistan. Those who agree to get us involved in such deployments shouldn't be surprised if the army is lacking something here or there." According to the retired officer, Germany also now faces the additional political pressure of committing 2% of the country's GDP to the military. In this situation, Berlin will only welcome reports on the military's lack of preparedness, or insufficient funding. "Our defense minister is pleased to request various appraisals from the generals, and then push some frightening figures," he noted. Today, Scholz stressed, Germany's security, from the strategic perspective, is assured. Therefore, the current discussion in the media and the government about the state of the Bundeswehr relates for the most part to its unclear mission. "I still believe that things that were important in 1990-1991 don't really apply today. I'm talking about the fact that we are surrounded by friends. When you're surrounded by friends, you do not need to prepare for some completely unrealistic scenario…That's why some people resort to all sorts of tricks to try to increase the importance of the armed forces. This includes talking about the 'Russian threat,' agreeing to participate in operations in Africa for the sake of French interests, and so on," the officer concluded.